I'm a big fan of Naked. It took me a while to discover the brand but once I did, I was quickly converted. The products offer fantastic value for money, are a great way to try a greener approach to beauty and their shower gels are to die for. My first impression was that the names are fun and quirky, in keeping with other products from the brand. Perfect Getaway Cleanser is the first step in the regime. I'm sorry to say that I absolutely hated the packaging- it simply didn't live up to my needs in terms of functionality. I found dispensing the product itself difficult- it's a flip top bottle as used for their shower gels. I can understand that this is a cost saving for the company, particularly whilst they see if the skincare will prove successful but this style simply doesn't lend itself well to the bottle format containing a relatively thick cream formula. When I did manage to dispense some of the product, I ended up with far more than I needed so on future uses, found it was easiest to unscrew the lid. Please Naked, can you replace with a pump?! Having said that, wastage is hardly an issue at a bargainous £4.49 for 200ml. I think it offers great value for money so two very positive thumbs up for pricing! Perfect Getaway is ideal for sensitive skin, such as mine. It's a gentle, cream cleanser in the traditional sense. In fact, it's so gentle that I found I was able to use it to remove light eye make-up. Those who wear heavy makeup may need to double cleanse. Perfect Getaway feels incredibly nourishing and I liked that you don't need to wash it off as I can find this too awakening in my pre-bed regime. I couldn't detect any scent, other than what you'd expect from a natural lotion. 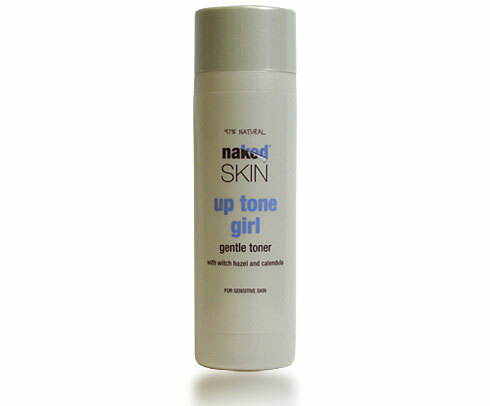 Next up is the toner, Up Tone Girl. This is a liquid formula in a squirty bottle which lends itself far better to usage. The design on the bottle is fairly basic- it might have been nice to reflect the unique name with an associated image- and I'd have preferred a transparent bottle in order to see how much product is remaining. I don't usually use toner- if I feel I need something extra, I'll splash my skin with cold water & I keep a spritzer on my desk for use throughout the day so I was intrigued to see if this could convert me. ﻿I definitely felt that the extra step benefitted my skin as I initially experienced some minor breakouts (which I can only put down to the additional cleaning benefits). The product has quite a medicinal scent which I found surprising given the brand and although it's by no means offensive, I have to admit that I was expecting something more natural. I didn't particularly like the feeling of the residue which was left on my skin- whether this is down to my lack of experience with toners I'm not sure but I didn't find it especially nourishing and it left me wanting to further clean my face. Having said this, I would recommend this toner as a good choose for those seeking value for money. A little goes a long way and although it's not going to add any luxury to your skincare regime, it would be a good everyday option.